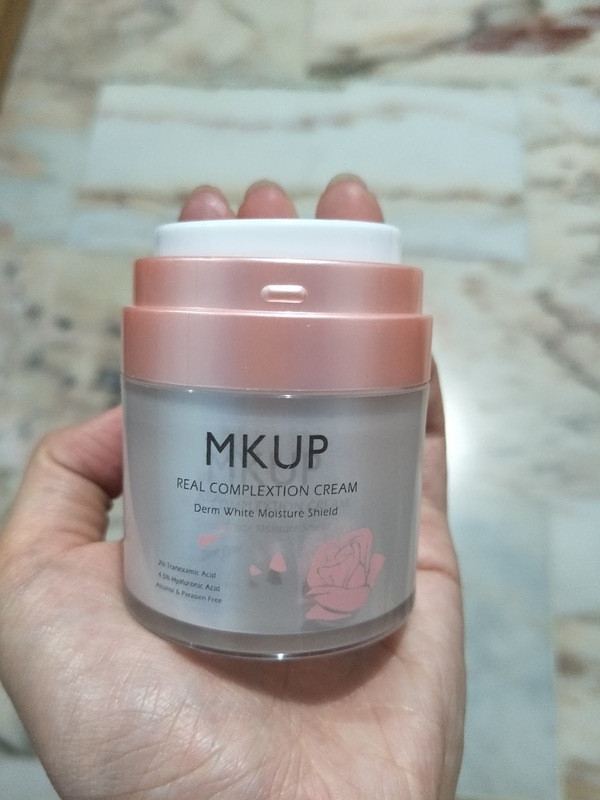 And recently there were tons of raves about this real complexion cream by MKUP floating around on the internet. All the awesome things this product claims to do are stated on the back of the packaging. 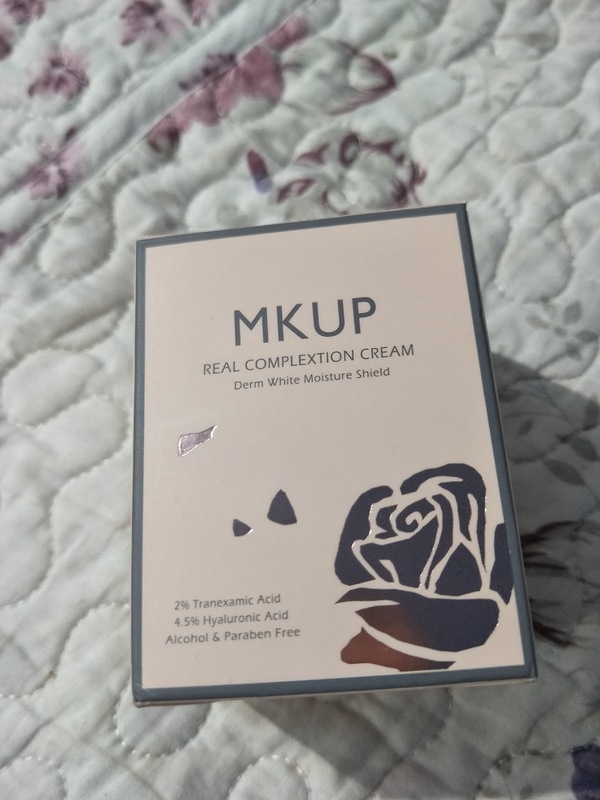 But if you haven't heard of this crazily raved product or seen the magical video of how it changes your dull and horrible complexion into a flawless looking one in mere 5 minutes, then you should know that MKUP boasts of this complexion cream as the only product ladies need, for EVERYTHING. Be it as skincare, or cosmetic. Be it day routine, or night routine. You just need this ONE bottle. Anyway, over to the packaging first, which I really like. The entire packing was really pretty (pinkish, rose print and all) and handy. And having the cream kept in a push down air pump means no chance of product contamination. Usually, just 1 full pump is enough for me to apply the cream all over my face and neck. 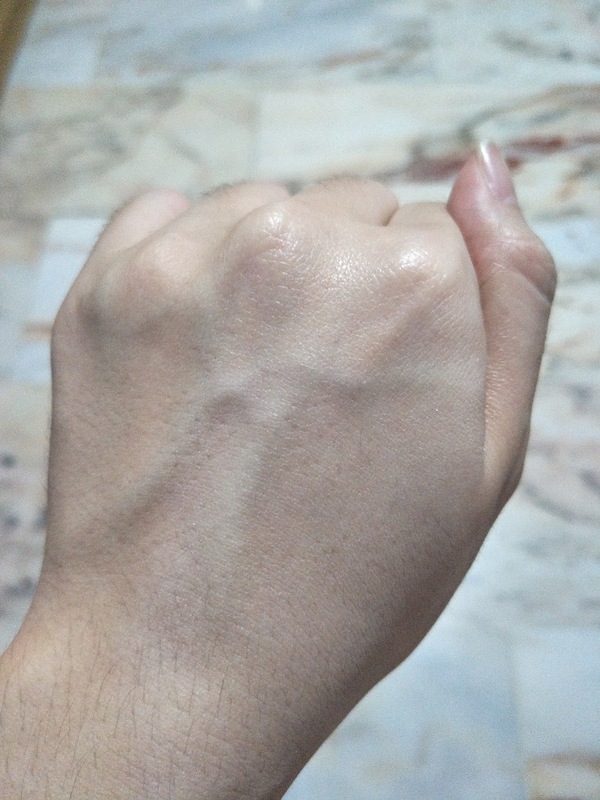 As you can see, the cream is white, with a pale purplish tint. It also comes with a lovely, sweet floral scent, which I love so much! Texture wise, it may feel a tad heavy and sticky when you first try to spread it out, but it does get absorbed (or feels to be absorbed) eventually, giving you a matte and slightly refreshing feeling. While spreading out the cream. And as you can see, this product will definitely create a ghastly looking white cast and give you a glorious geisha-inspired finish look if you pile it on. So really, a little goes a long way. And after blending it out, TADAA~! You can see absolutely NO effects! 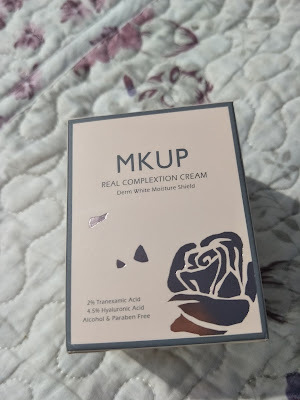 Everything MKUP's video claimed to do, all the concealing of undereye circles, redness from blemishes, dilated pores and etc, it doesn't. 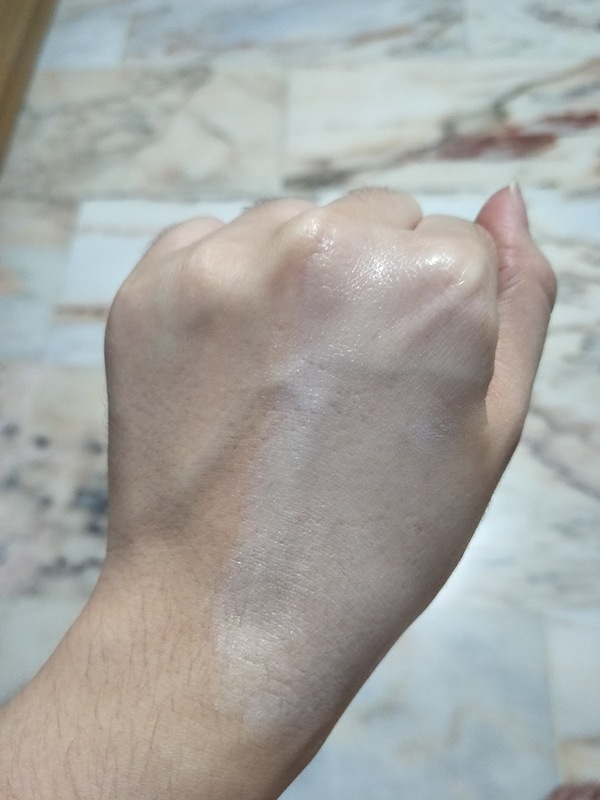 If you apply more, thinking that the no visible effect is because of too little product applied, then you'll end up with a ghastly white cast. The whole claim of how we can substitute everything (skincare included) in our routine with just this 1 bottle is also a huge fraud. Don't fall for it, ladies! The ONLY saving grace of this product, other than the lovely scent and packaging, would probably be the oil control efficacy. When using this, I found that my face was a lot less shinier at the end of the day. If you're an oily girl like me who wear glasses, you'll understand the pain and annoyance of having your glasses slipping down your oily, slippery nose every other few seconds of pushing it back up. But when I was using this product, my glasses pretty much stayed put on my nose throughout the day. And yes, I said, "when I WAS using..."
And why am I not using this anymore? Because THIS BROKE ME OUT. I developed TONS of whiteheads around my nose (the butterfly area) and on my chin. And it kind of make sense that it happened because something in this product is preventing my facial sebum from coming out from my pores to the skin surface and hence everything got clogged inside and formed whiteheads. So, this product doesn't really do oily ladies good, and neither will it do dry ladies good (because it's more mattifying than hydrating). So really, what's with the hype, huh? EDIT: THIS PRODUCT CONTAINS TITANIUM DIOXIDE. 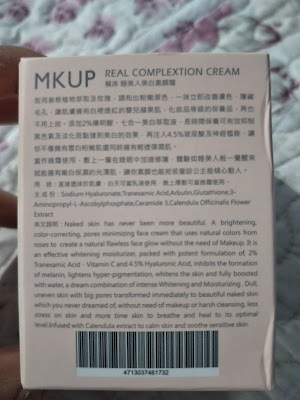 IT IS NOT A SKINCARE! YOU ABSOLUTELY HAVE TO REMOVE IT AT THE END OF THE DAY LIKE OTHER MAKEUP PRODUCTS. ps. 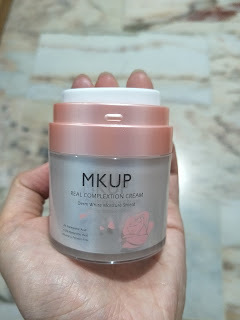 The video states this product hails from Korea, but I believe MKUP is a Taiwanese brand. 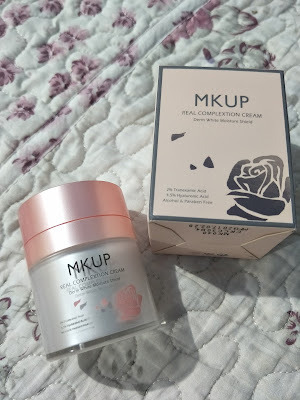 Dear Mia, thank you for sharing your honest experience with us :) Was pretty much sold on this, but after hearing about the lack of coverage and resultant breakouts I will reconsider. Do you know how much is the 30ml product in taiwan? Hi there, I'm not very sure how much it's retailing in TW. but I do remember watching a youtube video review before and the youtuber mention it is over NT $1000. Tried for half a week, and it clots my pores and starts to have outbreaks and blemishes on my cheeks. I seldom grow one pimple on my cheek. Wth. ikr, its clogging abilities is stellar. maybe you and your friends have very resilient skin condition? look up at unknown's experience. she experienced breakouts too. came across a few IGers and youtubers who also admitted to experiencing breakouts. Hello! Just my honest review here.. I have sensitive and oily skin, and I bought the 10ml tube to try out after getting tempted by the videos. It's been 2 weeks since I used it and I'm in love with this product! I used to apply loose powder (without foundation) daily to mattify my skin. 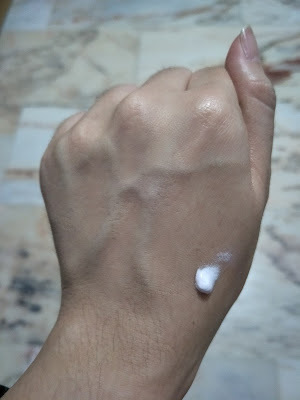 After using this, I ditched my loose powder as this cream makes my skin look dewy yet matte. It evens out my skin tone a little too. It hasn't clogged my pores yet and I'm crossing my fingers. But yes, I have to remove it with makeup remover every evening as it doesn't feel clean just using my normal cleanser. One man's drink is another man's poison I guess. I've tried multiple BB creams in the past and they all clogged my pores. But for this cream, so far so good! Same here. Used as premakeup primer then with compact powder. Removed with makeup remover. Loved it for few days of use as it whiten skin and control oil. Nightmare came about after a week of use. I had breakouts with white mini pimples all over my face. 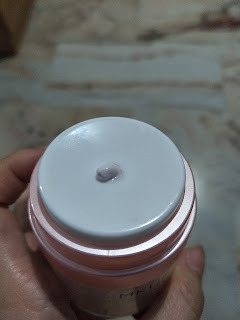 I am not sensitive skin can basically can use any brand on the shelves at Watson or Guardian, but after use this I am wary now.